Home › Advertising Attention › Are Viewers Paying Attention to TV Ads? Are Viewers Paying Attention to TV Ads? Before an audience can be affected by advertising messages, they need to first be paying attention. Then once they are exposed to an ad, with enough media weight and with the content of the ad creating impact, then the awareness and recall building process can commence. However, there are several factors that compete for the attention of a viewer. Recent research suggests that 45% of Adult 18+ viewers watching TV are paying attention to the advertising. So, what’s the other 55% doing? 26% are multitasking – sort of watching the commercials, but with a device in hand, also checking email, making a Twitter or Facebook post, reading an online article. However, various research does exist and suggests that a good portion (from 25 to 50%) of multitaskers can recall TV ads, especially high impact ones – those that entertain or elicit some type of emotional response. Then since the days of the VCR and playback mode, a viewer could always skip through the commercials, and 15% of viewers do. Even now with DVRs in playback mode, 85% of viewers simply let shows playback, commercials and all. And of those 15% that skip through commercials, there’s evidence that viewers can again recall those with high impact, most likely because it was a memorable ad that they had seen before. In summary, lower attention via either multi-tasking or skipping is not necessarily bad news for advertisers as long as they target the most effective ad content (stellar creative) to the appropriate audience, and use the TV ad as a springboard for consumers to engage with the brand online. Consumers are viewing news and entertainment content on many devices. 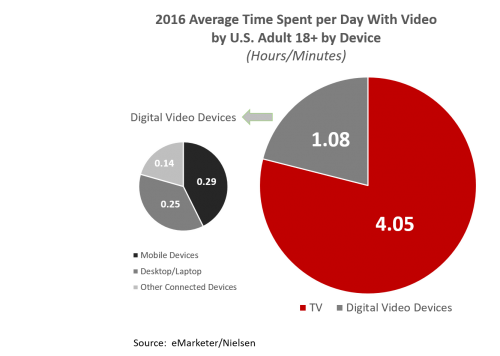 However, the lion’s share of time spent with video devices continues to be TV at four hours, five seconds per day.